Wolves have a reputation for being fierce hunters. Therefore, some may be surprised to find that, in reality, less than 10 percent of their hunting efforts are successful. 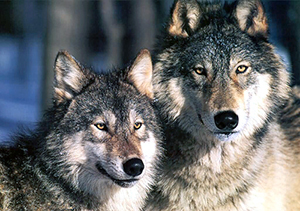 A carnivorous species, or meat-eaters, wolves hunt in groups called packs. While they are sometimes satisfied with smaller animals like birds and mice, wolves typically prey on larger creatures such as deer, moose, and elk. Wolves depend on their hunting grounds, which can range from 30 to 800 square miles, to survive. Wolves can survive for up to two weeks without eating. To prepare for food-less weeks, they may store some of their food by dropping it into a hole in the ground, called a cache, and covering the area with dirt or other debris. One of the biggest factors that influences wolves' success in hunting is the response of their prey. For example, deer and caribou may outrun wolves. Additionally, moose can use their sharp antlers and heavy hooves to fight back. A moose's hooves are so heavy, in fact, that they can crush a wolf's skull. While wolf hunting may seem vicious, it actually helps balance the natural world. Wolves generally kill the young, old, and sick of their prey. In this way, their prey benefit too. When killed, the sick are less likely to spread their diseases. When the young and old are killed, remaining animals have more food. This balance ultimately helps both predator and prey stay healthy.